Funds will support junior Tierra J. Woods in furthering her educational endeavors. 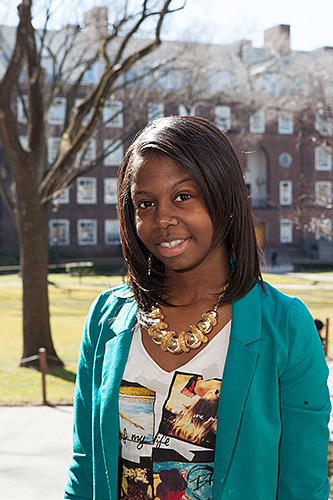 Woods, a SEEK student, plans to study abroad with part of her scholarship. Far Rockaway native Tierra J. Woods is determined to make a difference. According to her, most of her peers from the neighborhood either have children or are in jail. A few are dead. It’s that kind of change-the-world attitude that landed Woods a $10,000 scholarship from State Farm Insurance and Black Enterprise magazine to support her educational endeavors. The award honors the late Barbara Graves, who earned a bachelor’s degree in education in 1957 and a master’s of science in education in 1966 from Brooklyn College. Graves was the wife of Black Enterprise founder and publisher Earl G. Graves. She played a vital role in the growth and development of the publication and media company, helping to advance its mission of economic empowerment and wealth building for African Americans. She received a Presidential Medal from the college in 1993 and served as chairwoman of the Annual Fund Committee in the 1996-’97 academic year. She was also a member of the Brooklyn College Foundation’s Board of Trustees from 1991-2001. Woods, a student in the Percy Ellis Sutton SEEK Program, who is double majoring in psychology and children and youth studies, was chosen on the strength of her academic credentials and an essay she wrote about what it means to be a woman of power. Her prize included travel to Orlando, Fla. to accept the award at the magazine’s 2013 Women of Power Summit, which is sponsored by State Farm. Woods says she will use the money to study abroad or to take some extra classes. She plans to pursue graduate studies and would eventually like to become a social worker, a high school graduate counselor, and to open that community center in Far Rockaway.